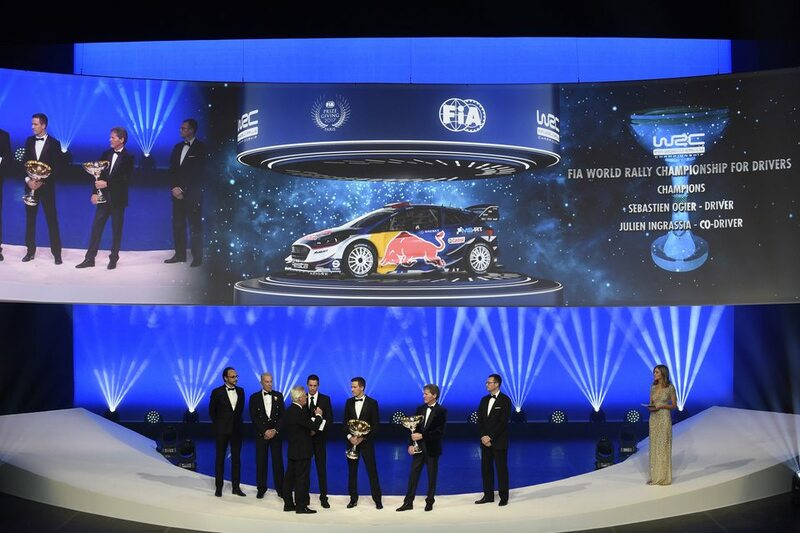 SÉBASTIEN Ogier officially received his FIA World Rally Championship trophy at the annual prize-giving of the Federation Internationale de l’Automobile in Paris on Friday night. Ogier, who wrapped up his fifth straight season as champion driver at Kennards Hire Rally Australia three weeks ago, was part of a glittering ceremony at the Palace of Versailles where all 2017 FIA champions were recognised. Other WRC awardees were Ogier’s co-driver Julien Ingrassia and Malcolm Wilson, whose M-Sport World Rally Team won the 2017 manufacturers’ title. Toyota WRC driver driver Esapekka Lappi received a special FIA Action of the Year award for a spectacular 33 mere, 120 kmh flight over the Fafe jump at Rally de Portugal. Ogier’s fifth consecutive title puts the Frenchman into sole second place in the list of multiple title winners, ahead of legendary flying Finns Juha Kankkunen and Tommi Makinen. His 2017 championship victory was perhaps his sweetest to date, coming after the departure of the all-conquering Volkswagen factory team, with which he had achieved his previous four titles, and being achieved with the privateer outfit M-Sport. “It’s amazing and we are very proud that we managed it again this year, because I think everyone is aware of the challenge we had to face with the retirement of our old team and we had to find a new solution at the last minute,” he said.